This high-volume production scanner is designed for banks, government, service bureaus and any high-volume scanning environment. It delivers great features and functionality to help increase efficiency and decrease scanning costs. 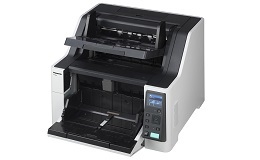 The KV-S8127 and the KV-S8147-V deliver incredibly high scanning speeds - 120 and 140 pages per minute respectively. You can switch seamlessly between manual and automatic feeding or take advantage of the Auto Rescan and Auto Preview functions to bypass inputting complicated scan settings, and to review and adjust images without having to rescan. From double-feed detection and double-feed skip functions to mechanical skew correction (KVS8147 only) and staple and jam noise detection, the KV-S81 Series' intelligent feed controls limit time wasted on paper-feed errors. With a sizeable daily duty cycle of up to 100k sheets, long-life rollers that last for up to 600k sheets, highly dependable hardware and effortlessly easy maintenance, both models deliver exceptional durability, without compromising on performance. ADF Feeder Paper Size Min. - W x L 1.9" x 2.75"
There are no product warranties available for this item.